When it comes to smart thermostats with Amazon Alexa integration, the Nest Learning Thermostat and the ecobee4 always seem to draw everyone’s attention. They’re both fantastic products, of that there is no doubt, but they’re also certainly not the only games in town. 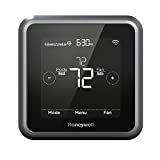 If you want a smart thermostat that gives you the ability to control your heat and air conditioning with Alexa but you don’t want to pay $250 to get it, definitely check out the Honeywell Lyric T5 Smart Touchscreen Thermostat. It has a great look, great features, and a price tag that’s under $100 today on Amazon.